See that? Willow – our home, our bedroom, bathroom, kitchen, lounge, our vehicle, our shelter, pretty much our everything in terms of material possessions up there on a ramp about to have all her wheels taken off. This was where Willow spent Saturday, Sunday and Monday night. We on the other hand, by virtue of not being allowed to sleep in here there got to stay with our wonderful friends nearby. We had beds, baths, sofas, TV, electricity, we had all our favourite meals, Ady got to hoover and wash up (things he dearly misses! ), I got to chat to my friends til the early hours of the morning and sleep in til much later in the morning (a thing I dearly miss) and Dragon and Star got to play with, watch films, connect on DS consoles and generally hang out with their mates (things they dearly miss). Willow needed attention to her brakes – Ady does the driving (although I really must do some, I hate the idea of not driving at all for a whole year) and was feeling a decline in the brakes and having to press harder and harder on the pedal to get it to stop, particularly disconcerting when in control of a heavy van, loaded with all your possessions and your family hurtling down a hill! 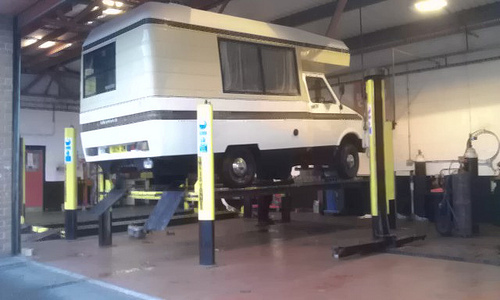 So we took her to a garage to have the brakes dealt with and are now £300 the poorer and have brakes that work. Money we can ill afford but can’t possibly begrudge and when split over the mileage we have already done in the van is fairly good going per mile I guess! We were fairly disorganised in decanting Willow into our friends’ house and had underestimated how long we would be without her so poor Ady ended up walking miles in the rain carrying bags of clothes, pillows and various other things – he said he felt like he’d just been evicted from home! Fortunately another friend was able to go to his rescue and collect him – have we mentioned before how lucky we are to have such wonderful friends?! All of us are now fully topped up, restored and in full working order and arrived tonight, slightly delayed at our next hosts, near Durham, up in t’north. We should probably reserve judgement until we’ve acually done some WWOOFing here but on first impressions as we sit snuggled up cosily inside a gorgeous yurt in flickering candlelight having shared a meal with our hosts, listening to rain pitter patter on the roof and glancing at the stars through the clear roof panel. The yurt seems to be incredibly well set up with everything we could possibly need and we’re really excited at the prospect of working with these hosts and learning from them. It was cosy, warm, comfortable and already feels like home :). I stirred a couple of times in the night – once for another visit to the portapotty (curse that tea!) and at least once just to revel in the fact I was asleep in my campervan :). Dragon and Star slept well up in their bunk and we all properly stirred just before 8am and it just felt lovely to open the van curtains and see the world outside while still being snuggled inside my sleeping bag. We’ve already shed a few things – the spare blankets and sleeping bags have gone back into my car which we have with us until the weekend when it will go into storage complete with anything stashed inside it. We’re getting used to the idea of living in different spaces – the kids bunk is effectively a storage space during the day and the cab becomes the storage space during the evening / night time. After a lovely day with family we headed just a mile or two along the road to stay with friends. Dragon and Star’s very close friends (and ours too) who live a similar sort of lifestyle to the one we hanker after ; growing their own food and being very much part of the local community. Dragon and Star instantly headed off with their boys and infact are sleeping in the house with them tonight while Ady and I have the van to ourselves. C & B came in the van with us and toasted adventuring with wine and crisps around the little table inside Willow. Tomorrow we get a taste of WWOOFing joining in with our friends’ Volunteer work day where local people come along and join in with growing in exchange for a share of the eventual produce. Today the sun has shone, we have been outside in T shirts, shared food and stories with friends and family and particularly for Ady the first steps towards being free with no schedule, no time keeping and no pressure have begun. As first day of the rest of your lives go it’s been a pretty good one. Two weeks from now we will have left our house. Three weeks from now we hope to be somewhere in Dorset or Devon, enjoying the early onset of Spring and sleeping in our van. Four weeks from now we’ll be sleeping in a tent at our first host. Today was another ‘last’ at work for me, my last Wednesday shift. I have two shifts left at work. I told a couple of the regular customers today – both retired women well into their senior years and got resounding positive responses from both. I do sometimes wonder if the older generation look at my age group and wonder just where all our adventurous spirit has gone, hopefully we’re reassuring them it’s still there if a bit hidden under worrying about pension plans and plasma TVs. A neighbour also came knocking on the door for a nosey chat too and was also very encouraging and supportive, telling me that her and her husband have a series of virtual boxes that they like to think they will tick all of before they die and aim to tick at least three or four per year. Ady and I both chatted to a very dear friend on the phone tonight too (waves at Rob) who was also full of the sort of positive encouragement it’s nice to hear. But let’s have some ‘firsts’ shall we? Today I had my first real life conversation with one of our hosts. The place we will be staying at second. The host rang to confirm and to just tighten up plans, introduce herself with a real voice and say she is looking forward to meeting us all. There will be another family (with four kids) staying there the same time as us and she has loads planned to keep us all busy and give us a real flavour of what the lifestyle involves. It felt really exciting and very real to be actually talking to someone. We have had another couple of yes replies from hosts in Zone 3 and are now as booked up as we need to be, which is a great feeling. Willow will be very briefly in our hands again tomorrow too as we are picking her up from Doom Monger Mechanic who is thankfully charging us a very reasonable rate indeed for the battery and some leads to make jump starting easier (the battery is in a *very* inaccesssible place, only really get-able to from inside the van, he’s fitting some leads with a key operated switch meaning we can jump start the van from the outside if the need should arise. We have a really good charge-holding power pack with jump leads which should mean we have a first line of defence against unreliable older engines, with decent breakdown cover being our second line of defence. I’m not thinking too hard about a third – I suspect it will resort to chocolate, alcohol, sobbing and quite probably ringing my Dad to come and bring us all home again because we’ve had enough! 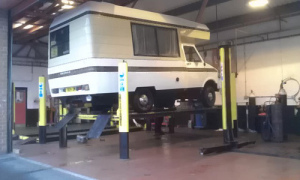 Let’s hope we never reach the third line of defense… So we’ll be collecting her, finally, and then taking her straight to Happy Bodger Mechanic who assured me on the phone today he could pug the manifold and get it through an MOT *and* have it back to me for next Wednesday. It’s tight, it’ll cost money and it will mean we have just one week with Willow to get her packed up and ready to go but it’s doable. A big characteristic of this whole adventure is the fairly small margin for error. We’re on a tight budget, travelling in a van which is well into advanced years while we are not far behind ourselves but hope, optimism, sheer bloody mindedness, a huge support network of friends wishing us well is enough to propel us at least halfway round the country and I reckon the van is up to the other half at least.